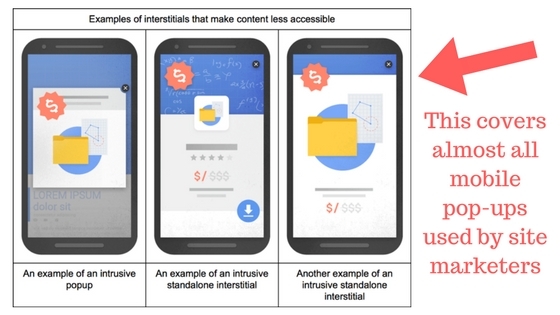 It was announced in January of 2017 that Google had officially rolled out their “interstitial penalty” for websites using mobile interstitials (you can read more about interstitials here). What this essentially boils down to for most sites is a Google penalty for mobile pop ups. This was widely reported but wasn’t necessarily properly emphasized to the millions of site owners and publishers who use mobile pop ups on their website. Much of the news related to this Google penalty was directed at interstitial ads that publisher might display. However, in implementation, Google appears to be penalizing all website that use any kind of content covering pop-up on their site (including newsletter sign-ups and other common types of “on-scroll” pop ups). Below I’ll highlight how this Google penalty for mobile pop ups is working and outline exactly what you should do about it so that you don’t get burned. When this news about an interstitial penalty was originally announced, it was believed by many that Google was simply trying to get publishers to eliminate annoying interstitial ads from their sites (ones that block all of their content on pageload). However, what we’ve seen communicated and applied by Google seems to be much broader than this. Yikes. Maybe now we’re all paying attention. SEO is the lifeblood for many publishers and pop ups have become a common tool that has been used to improve conversion metrics and newsletter sign-ups for years. Is Google really killing a publishers ability to implement mobile pop ups? No one wants a Google penalty against their mobile site, but many popular websites have depended on these mobile pop ups to drive e-book downloads, webinars, additional pageviews, and newsletter sign-ups. Ultimately, the impact of the penalty will likely cause these sites to remove these pop ups on mobile devices; thus hurting their business. In case you’re thinking that this won’t be a big deal, here’s some of the early results I’ve seen from this penalty. This isn’t some kind of comprehensive case study, but if you take Google at their word and take into account that other sites are reporting the same behavior, it appears that this penalty for all types of pop ups are real (and dramatic). 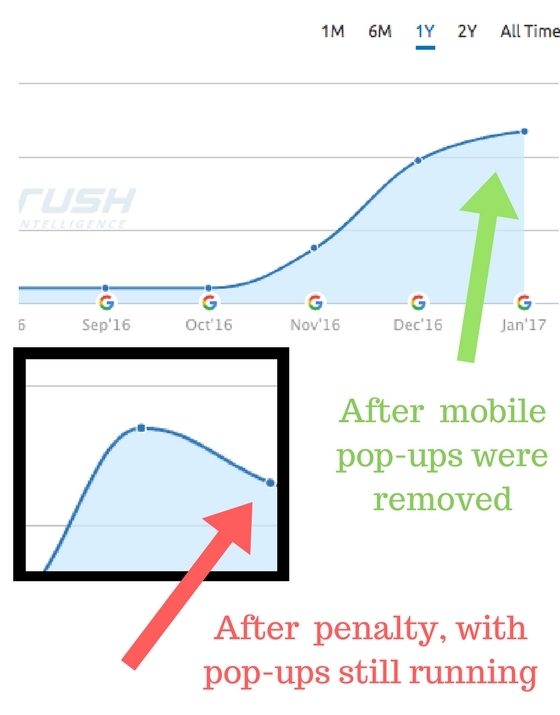 Search Engine Journal recently posted a response from John Mueller, from Google, regarding the types of different mobile pop ups and how they affected by this penalty. In this conversation, you can see that exit-pop ups are not necessarily included; however, exit behavior is very different on a mobile device than it is on desktop. In our example above, we were actually using an “exit pop-up”; however, this basically meant that it would appear on an up scroll by a user. This still would potentially block content from the user after their first clock from search. Other site’s have reported the same drops in search keyword position on mobile when using these pop ups (and subsequent improvement after removal). Basically, most mobile pop ups on the first page of a user session are probably going to get you penalized by Google. What can you do to prevent this from hurting your website? John Mueller was pretty clear about what Google cares about in all of this. Google wants to make sure that mobile pop ups don’t block content on the first page of a user session when a user comes from Google search. This leaves the window open for site operators to have their cake and eat it too. While I would not advise any website to have a mobile pop-up on the first page of a user session on mobile right now, the new Google rules clearly do not prevent you from having these mobile pop ups display on the second page of a user’s session. In summary, set your mobile pop ups to delay until a user has reached the second page of a user session. This still burns a little bit because many users do not reach the second page before they leave the site. However, the evidence is showing that having mobile pop ups on the first page that people come to from search could see your site penalized by Google. It is a bit frustrating that Google is making this decision for site owners. We have long been advocates of testing and letting user experiences dictate what should and shouldn’t be implemented on your site. You should be doing this anyway, but in this case, your hand is forced by the search giant. What has your experience been with this penalty? Please get the conversation started below. NextWill My New Website Make Money Or Not? There are a bunch that will allow this functionality. PopUpDomination is a common one. Not 100% sure. They aren’t interrupting UX on the page, nor are they covering the majority of the content; which seems to be what Google is concerned about.